We know that the cell is the smallest unit of living material. All organisms are made up of cells! Each cell has a unique job. Some cells help us see, while some cells carry oxygen through our blood. How do our cells know what job to do? Special molecules called DNA tell them! DNA stands for deoxyribonucleic acid. Four different base molecules called nucleotides are the building blocks of DNA. These building blocks are adenine (A), thymine (T), cytosine (C), and guanine (G). Each nucleotide is called by their initials: A, T, C, and G. Because of these molecules structures, A and T can only bind, while C and G can only bind together. 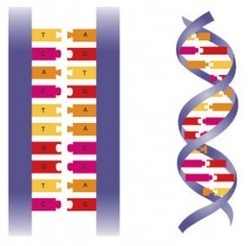 DNA is structured as two complimentary strands of nucleotides. This shape is called a double helix. The two strands can be pulled apart like a zipper! These words can make up sentences called genes. When describing the genetic makeup of an organism, we are describing its genotype. The genotype is the set of genes carried by the organism. A phenotype is the genetic expression of the gene and are usually traits that we can observe such as our appearance and behavior. For example, the genotype (genetic make up) for eye color determines the phenotypes blue, green, or brown eyes. Each gene tells our cells to make a molecule called a protein. Proteins help each cell do its job. So basically, DNA tells our cells what to do and proteins make our cells do it!